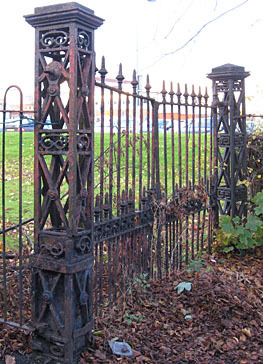 Years ago I drafted a page called ‘Any old iron’, mainly inspired by a pair of rusty old gates. It didn’t get finished as I thought no one would be interested. A recent letter to The Press has reassured me that at least one other person is interested. There may be others. Like many insignificant overlooked things, this small local detail has a connection to more significant aspects of our local history. 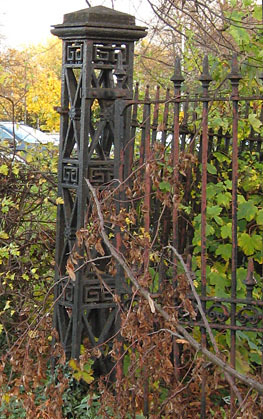 Behind Bootham Park, a stone’s throw from the nurses’ accommodation, are a pair of rusting double gates set between ornate gateposts. They haven’t been opened for years. To one side of the gates is the original railing, to the other side more modern railing, and they lead nowhere much. Behind them, a bit of grass and the car parks around the city’s main hospital, built in the 1970s. They’re forgotten, under trees, rusting away, bits of detail dropping off. Years ago I read an article in the York Historian on the history of the Walker foundry. It ended with a list of the foundry’s work, and included a brief mention of gates/railings on ‘Asylum Lane’ – as the pathway now called Bridge Lane used to be known. 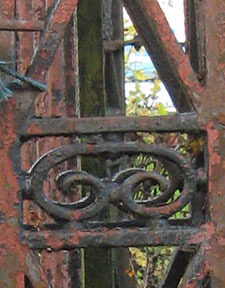 These must be those Walker foundry gates, dating from the mid-19th century. Examples of the foundry’s work can be found all over York, including by the old railway station (West Offices), on St Leonard’s Place, and at the front of the Unitarian Chapel on St Saviourgate (pictured). 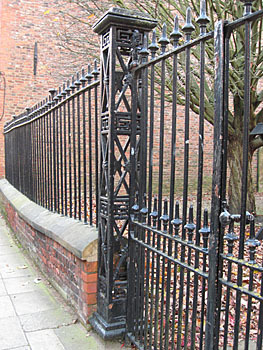 The railings and gates at the front and sides of the Bootham Park hospital grounds were also made by the Walker foundry. They’re Listed, but they’re rusting away just the same. Does it matter? Perhaps not. The NHS Trust has more important things to spend its money on than painting old railings and gates. These gates are just another small thing I’ve been passing for years and wanted to place on the big worldwide web. I hope they stay here, their ironwork crumbling gracefully. A reminder of local industry, when local businesses made big useful things. On Walmgate once the Walker foundry made ironwork: railings, gates, lamp posts. Not just for York, but for the British Museum and Kew Gardens. Old maps show nothing was built on the land behind these gates before the district hospital was built in the 1970s. Part of it was a sports ground, though the part directly behind the gates isn’t marked as such on the maps I’ve seen. The Walker gates apparently date from the mid-1850s. I’m not expecting anyone to remember the 1850s, but I know some of my website visitors were walking along Asylum Lane in the 1950s. Any memories/thoughts/local history info welcome, via the comments below. ‘The Walker Ironfoundry, York, c.1825-1923′, J Malden, York Historian (1976). York libraries have a copy of this book. I remember those railings,from my 8/11 years old sojourn at St Thomas’ School,in Lowther St,from whence we perambulated,crocodile lined,to the sports field(now Hospital Car park,and enjoyed football/cricket and athletic lessons.Not forgetting the diversion of the passage of the Silver Arrow bullet like train,on the adjoining railway line,a joy to behold to a young lad of those days. Remembering Asylum lane too,on my night time wanderings,Acomb to Heworth,in the early 1950’s lamp posts and railings pacemaking all the way. My grandfather Joseph Bagnall lived in York in Walmgate, I understand his family did have an Ironworks and did work in YOrk. My grandmother Jessica Bagnall lived in a newsagents of her father in Lawrence Street, he was supposed to be a reporter and landed in a rowing boat in uk to give the first news of the end of the french revelution. His surname would be Lilley I believe. My mother wrote a press article on it way back in the 1930s or 1940s I believe. I did have the cutting from the press. A very late reply to your comment from 2012, but only just come across it.There was a William Bagnall who had an iron foundry, probably in Walmgate. My Great Grandfather, GW Kirk served his apprenticeship as a moulder there in the 1870’s,before starting his own foundry business in 1885 near Layerthorpe Bridge. William did have two sons who continued after him, but I don’t think for very long, however there are still a number of Bagnall castings in York, mainly street gully grates and many more examples of GW Kirk’s work locally. I hope this is of interest, if you have information on the foundry businesses I would be pleased to hear. I believe that bagnall’s lived on Lansdowne Terrace. Some family members held the title of ‘Freeman of The City which some children will have inherited, one of them being Doris bagnall (married surname – Glen). Any other info on Bagnalls/Glen I am particularly interested in. I would. Just like to say my great mother Doris Bagnall…i never. Met you or my grandfather. My mothetr linda marie .aunt joanne aunt Shirley..,My new is angela Michael Pamela…my best. Cuz Dina marie .tammy lil billy …Ill say something. Ma aunty. Shri joanne …..You mom and DD brother. Ur the Bagnall……Angela Doris. Ortiz .Michael James. Ortiz pamela Gorden …..i all treat. W the repec t the deserve….papa ur daughter s loved you .please. dont wrong way …,dont my family. Doris Glen was my aunt, she was Doris Bagnall, sister of my mum Vera. there was also Edith and Jean, plus many other children who died young in the early 1900s. I believe there were at least three boys, Jo, Ted, Richard . life was hard in those early days. Grandad was a member of the Bagnall family the Ironfounders. he became a freeman in later years. My aunt Edith was allowed to become a Freeman in her later years. So glad I stumbled across this page. I love these gates and plan to record them as part of a project recording the history and surviving products from all the York Iron Foundries. I’m working on an app at the moment that will allow people to upload images of gates, railings, drain covers, fireplaces etc as they go around town. Watch this space! Also any information about the ironworkers themselves and their families would be fab. Thanks! Thanks Rachel – nice to know someone else admires these old gates! I think I read something about your project, sounds interesting. Do keep us posted on developments. There are a couple of your cousins on Facebook which I have managed to track down, but there was a split between their parents John (son of Doris) and Carol so they couldn’t help very much. I am particularly interested in Harold Glen, can you tell me anything a about him. If you wish to e-mail privately I would be happy. Have a walk along Bridge Lane and hopefully you will be pleasantly surprised.